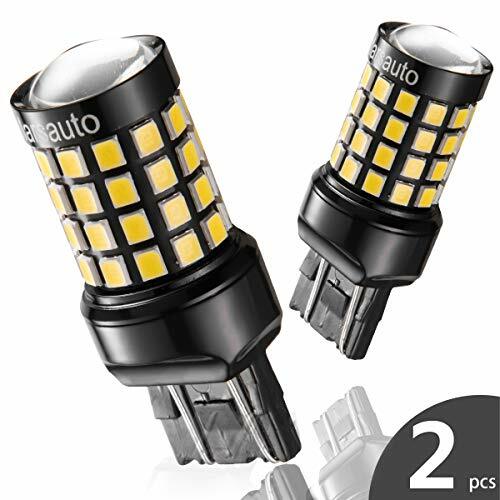 7443 7440 T20 LED Reverse Backup Bulb Extremely Bright, [2018 UPGRADED] Marsauto 52 SMD 3030/2835 Chipsets Back up Stop Tail Light Lamp Bulbs Replacement (Set of 2) by Marsauto at Zona Indonesia. MPN: ABK7443G2-2P-SU. Hurry! Limited time offer. Offer valid only while supplies last. ☻360° Beam Angle: 52 smd high power 2835/3030 chipsets, 1200 lumen extremely brighter than your yellowish halogen bulbs, with no dark spot. ☻6000K White,Better Light Beam: around: 48*2825 smd, top:4*3030 smd. Designed for projector on the top, and provide a better light beam. ☻No Polarity, Nice Connector: light on both sides, no need extra flip or modification. Built-in aircraft grade aluminum and great solid connection to the socket, provide a better heat dissipation and a longer lifespan. ☻1:1 Socket design, Hassle free installation:Fits for 992, 7440A, 7440AL, 7440NA, 7440, 7440LL, 7440ST, 7440NA, 7441, 7443, 7443LL, 7443ST, 7444, 7444LL,7444NA, W21W, W21/5W, 7443-SCK, 7443-SRCK, etc.Application for Tail Lights, Brake Lights, Reverse Lights, parking Bulbs,Side Marker Lights, Rear Light, Stop Lamp and Backup Lights etc. ☻Tips&Guarantee: CANBUS error free design for 95% vehicles. (For some vehicles like Jeep, Dodge, Cheysler, Audi, BMW, Mercedes-Benz etc maybe will have error message.) Built-in intelligent IC driver for better performance. If any questions, please contact us directly. we offer "24 MONTH"warranty, no hassle on return or exchange. If you have any questions about this product by Marsauto, contact us by completing and submitting the form below. If you are looking for a specif part number, please include it with your message.